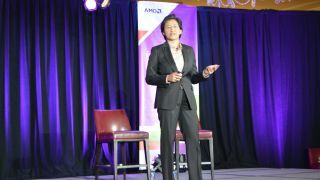 It comes as no surprise that AMD's attention is on the premium side of the tech spectrum, but Senior Vice President Lisa Su put to bed any inkling AMD may expand into lower-end hardware, particularly in mobile. "If you look at the entire ARM market segment, you're probably not going to see us in low-cost smartphones," Su said in answer to an audience question during an ARM-heavy San Francisco press conference. "Actually, I think you can say you're not going to see us in low-cost smartphones because that isn't our DNA," she clarified. "You're not going to see us in $2 micro-controllers because that's not in our DNA. We chose an inflection point to really jump into ARM." The press event contained a number of ARM server-side announcements. Su prefaced these comments by noting AMD likes how broad the ARM ecosystem is "in terms of volume and dynamics it drives, adding the company is "very, very specific about where we are going to differentiate." AMD used the press conference to outline its future roadmap, and the future is decidedly ARM. More to the point, it's decidedly 64-bit ARM with APUs and SoCs intended for the server and data center space. Su continued: "There's a reason we started with 64-bit. There's a reason we started with [Cortex] A57 and then going to K12. We are catching the point where we believe [there's an] intersection of the ARM ecosystem with higher-performance applications with graphics, with total compute, with our system-on-chip methodology ... that's really where we're going to differentiate. "Those higher performance, power efficient, more complex SoCs that have typically been of the x86 variety, we really intend to bring some of those to the ARM ecosystem," she concluded. Simon Segars, CEO of ARM, said that as the smartphone market continues to grow, manufacturers will need data stored in the places AMD is targeting. The newly minted ARM architecture licensee, he said, is "enabling choice [and] enabling innovation through the entire supply chain." Just don't look for that innovation to hit the lower-end of the mobile market.